TERMOLOG is a comprehensive software suite for design, certification, diagnosis and dynamic simulation of buildings. TERMOLOG powerful tools helps you solve easily simple applications and complex engineering problems. You can create the building model with the detailed TABLE INPUT or import DXF-DWG files and whole BIM-IFC models from any CAD BIM. A dedicated WIZARD defines quickly any configuration of plant systems. TERMOLOG is a comprehensive software suite providing access to many applications of building energy performance such as calculation of heat losses, energy requirements and consumption of buildings. The new dynamic calculation engine embedded in TERMOLOG allows the hourly energy simulation of the building according to ISO 52016 Standard. The software calculates the energy performance indexes of winter heating, domestic hot water production, summer air conditioning, ventilation, lighting and transport, either for buildings with a central heating or composed of several autonomous units. It proves to be an effective and flexible support to model and design high performance buildings (e.g. Near Zero Energy Building, LEED and GBC Certified). TERMOLOG evaluates the cost-benefit ratio of different energy retrofit actions and helps you achieve the energy audit of buildings. TERMOLOG delivers solutions for your advanced design challenges with its dedicated tools: PROGETTISTA DINAMICO, DIAGNOSI DINAMICA, SOLARE, ESTIVO, IMPIANTI and PONTI TERMICI FEM. 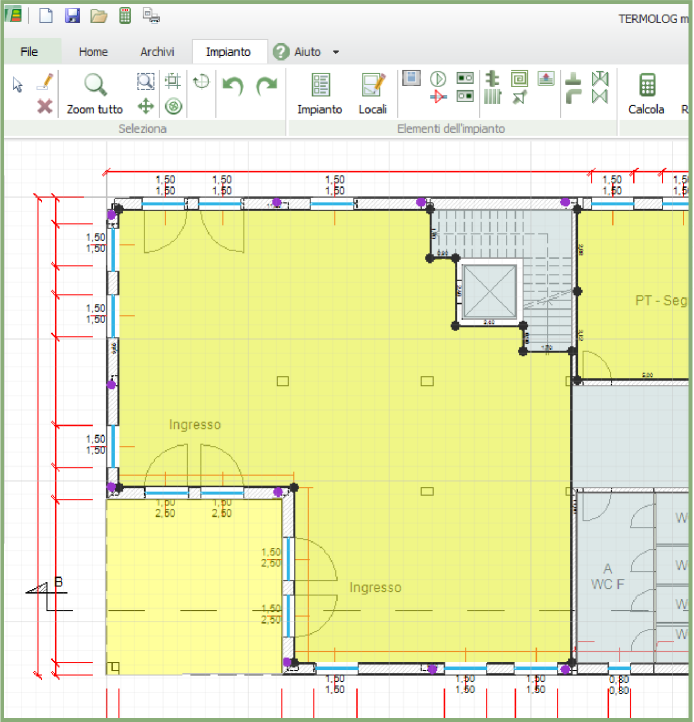 Create your building model with the intuitive TABLE INPUT or import DXF-DWG files from any CAD and automatically identifies areas, volumes and dispersing surfaces. TERMOLOG easily creates your realistic 3D model detecting orientation, surfaces arrangement, shadings by vertical and horizontal projections and by neighbouring buildings. TERMOLOG automatically calculates thermal bridges due to the presence of corners, balconies and windows and combines discontinuities with opaque structures. IFC files from BIM CAD. TERMOLOG imports and exports the commonly used IFC (Industry Foundation Classes) format, adopted by many BIM CAD. You can import your CAD IFC-format model into TERMOLOG, generate the calculation model and perform project, certification or energy diagnosis checks. TERMOLOG identifies design features such as stratigraphy, shading or environments and recognizes complex geometries and materials. TERMOLOG also exports the IFC file and so generates the BIM Model for further multidisciplinary investigation. IFC technology helps multiple team members work on a project using a shared model, comparing energy and structural building performances. You can import the TERMOLOG BIM Model in TRAVILOG – the structural analysis and design software for 3D Finite Elements Analysis - and combine energy with seismic building diagnosis. Working on one unified platform definitely reduces the risk of data translation errors and improves the whole design process. TERMOLOG wizards leads you through a series of easy steps to quickly design various typologies of HVAC systems, even with several terminals and multi-generation systems. You can easily choose and design windows with similar features and simply change sizes. TERMOLOG embeds powerful tools to make energy and economic analysis of building retrofit, comparing different scenarios. You modify the energy model and choose the best retrofit solution, estimating fuel saving and CO2 emission reduction. TERMOLOG can model any heating system, such as water, air or water-air systems (even with heat treatment and recovery units). You can simulate either buildings with a central heating or composed of several autonomous units and choose among various energy technologies: fossil fuel, biomass generators, solar thermal and photovoltaic panels, geothermal, electric and gas heat pumps, district heating and micro or small cogeneration. 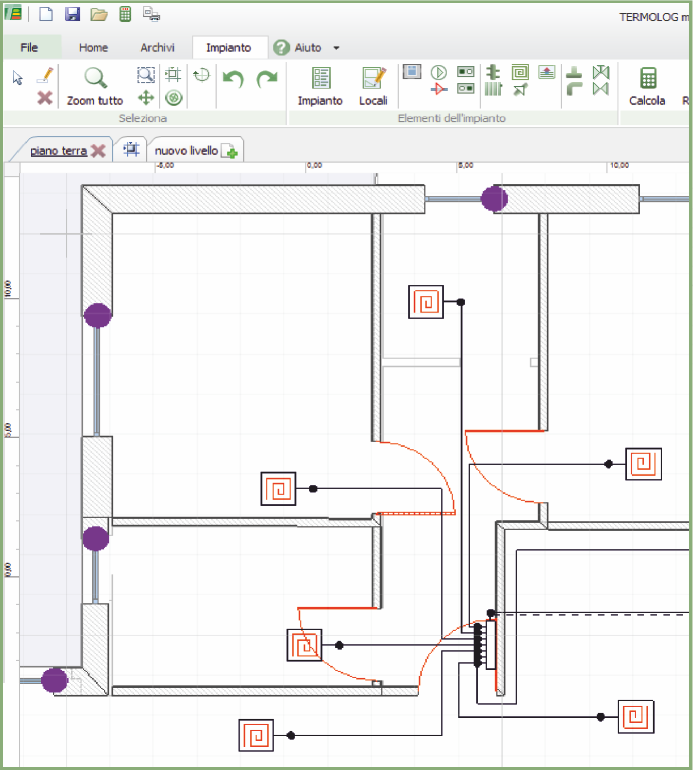 Use TERMOLOG Modulo IMPIANTI to graphically arrange the heating system model, from terminals to the control unit: it automatically fills in the subsystem details, calculates emissions and designs the distribution network. TERMOLOG simulates both winter heating and cooling loads calculations. The latter are performed according to the CARRIER Method. TERMOLOG evaluates the electricity requirements for room lighting, elevators and escalators. It calculates multipurpose plants consisting of several generators and the energy supply from renewable sources, verifying the percentage of coverage of the required demand during the design phase. TERMOLOG includes a rich database of generators and materials that can be further expanded by the user. You can choose among a wide range of pre-calculated materials and stratigraphy approved by the technical standards. A cooperation with major brands guarantees an updated database with a wide range of materials and over 2500 commercial generators, such as boilers and heat pumps, to easily set up stratigraphy and plant parameters. Logical Cloud technology enhances interoperability with members of an extended project team, sharing materials and projects among computers and mobile devices. TERMOLOG is a comprehensive software suite that provides advanced performance simulation tools to minimize modelling time and maximize productivity in the sustainable building design. TERMOLOG intuitive graphic input easily creates the energy model of a new construction or an existing building. BIM-IFC standards enhances interoperability among team members of different expertise such as architects, engineers, urban planners, landscape architects, etc.. 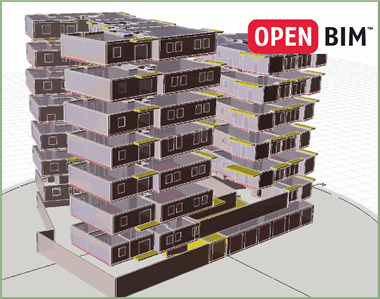 The embedded ISO 52016 standard dynamic calculation engine accurately calculates the building energetic behaviour, simulating different sustainable design approaches. Environmental certification protocols for buildings, such as LEED protocol, grants a higher number of credits when the building energy performance is carried out with a dynamic simulation software: TERMOLOG is the solution that will make you successful. Logical Soft is a member of Green Building Council Italia and TERMOLOG innovative approach definitely contributes to the development of the Green Building market.